Okay boys and girls, this is it. The LAST drift practice day for 2011!! This will be your last time to get out on the track in a non competition day. For anyone new to the sport wanting to have a go now is the time! 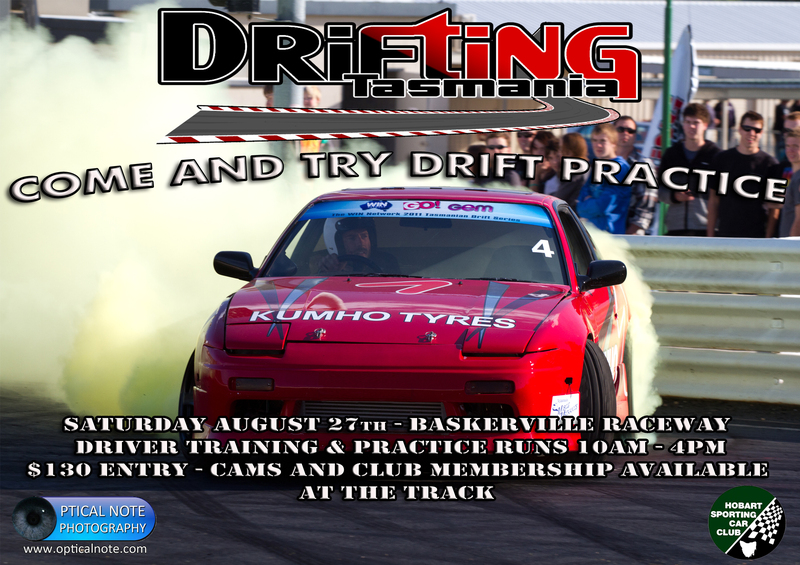 Driver training and practice runs from 10am until 4pm Saturday! As on the flyer $130 entry fee (CAMS and club membership - available on the day). 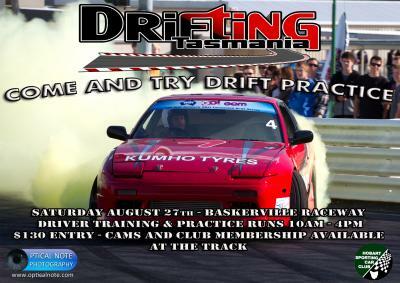 Baskerville Raceway is one of THE BEST drift tracks in Australia so take the opportunity to start learning on an ideal track! AND an exciting new addition to the practice day time table, our Clerk of the Course has allocated 1 hour between 11.30am and 12.30pm during the next practice day/come and try day for sponsor rides. All sponsors must be proven to the Clerk of the Course to be legitimate sponsors and they must sign a Passenger Disclaimer before getting into the vehicle. Drivers will also have the opportunity to ride together for training and development purposes throughout the day. All runs with passengers will be single runs. If you intend to put a passenger in your car you must declare this to the scrutineers at scrutiny and your car will be marked accordingly so that start line can identify those eligible. It is important to note that a CAMS compliant roll over protection structure is a cage that satisfies the current FIA standards as found in Schedule J of the General Requirements in the CAMS Manual of Motorsport, which can be found here: www.cams.com.au or in the attached document. You do not need to have your roll over protection structure certified and log booked to be able to take passengers on a drift practice day, it just needs to be CAMS compliant as per schedule J attached, and the scrutineers need to be satisfied that it is indeed compliant with the schedule. However, Drifting Tasmania recommends that you do have your rollover protection structure certified by registering your vehicle by way of a log book.